This page tells you all you need to know - in order to plan (and enjoy) your trip. Be sure to run this page off on your printer before you set off - preferably in full colour. It will act as a handy reference & guide. There are frequent low cost flight connections to Kerry Airport - from Dublin, London (Stansted & Luton), Frankfurt and Berlin. For flight times and bookings, click onto Kerry Airport. There are even more European flight connections to Cork. If you're coming from the U.S.A. there are daily direct flights from New York. (Newark), Boston and Chicago to Shannon. Both of these airports, by the way, are a 3-hour car journey from my place. As Ballinskelligs is still another 1 & half hours away from Kerry Airport, you will also need to hire a car. Just click onto Car Hire. Another possibility, is to arrange for a cab to pick you up from Kerry Airport - and drop you back afterwards. Our local taxi service, Haulie & Liz O'Dwyer of Ballinskelligs, is very reliable. Contact them for a quote on 087 294 8635 or 087 688 9620. As you drive out of Kerry Airport, turn left. Shortly afterwards, you come to a T-junction at the village of Farranfore. Turn left here - then very shortly after, you take a turn to the right, onto the start of the N70 for Killorglin. But be careful you don't miss it! It's a concealed turn-off. Carry on driving onto the N70 - direction Killorglin. After Killorglin (still on the N70), you head for Cahersiveen. For further directions & a map - click here. 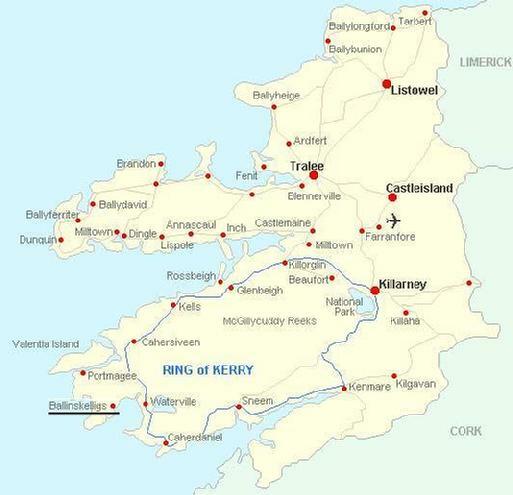 There are regular direct rail services to Killarney from Dublin and Cork. For your detailed rail timetable, please click here . Please note however that Ballinskelligs is still a further 1 & half hours away from Killarney, by bus. So you need to take a bus from Killarney to Cahersiveen (the nearest small town to Ballinskelligs). Although the bus station is within walking distance of the railway station...their respective timetables are not always synchronised! And sometimes there is only one bus per day - connecting from Killarney to Cahersiveen! So please do check the bus times, by clicking here. And do it before you decide which day you're coming to see me. Otherwise you could end up stranded in Killarney for a half-day! Bus Eireann also run bus services via Killarney from Belfast, Galway, Sligo, Athlone, Limerick & Waterford. Day 1 - Travelling by rail &/or bus to Cahersiveen. 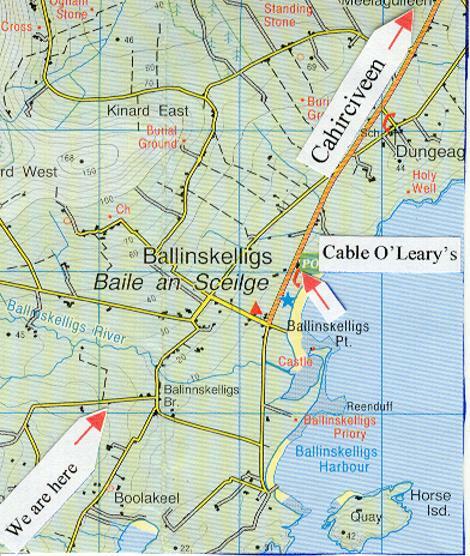 Day 2 - A 20-minute taxi ride out to Ballinskelligs + your actual session itself + your trip back to Cahersiveen. I will be happy to drive you back that evening. Day 3 - Your return trip home, by bus &/or train. For a local Cahersiveen taxi - call 087 294 8635 or 087 688 9620. It would be a good idea to stay stay for 2 nights in Cahersiveen itself. For details of a recommended guest house click here. Car Hire in Killarney, might be a more attractive option for you? If so, just click onto Car Hire. If you are using a Sat Nav system, it will probably take you to the middle of the townland of Ballinskelligs. Stop there and phone us on 066 947 9236. We can then talk you in! Or maybe you can direct your Sat Nav to my Eircode address - V23 Y044. Or just use my GPS coordinates? See below. Alternatively, why not let Google plan your exact route for you? Just Click here for your detailed itinerary. Coming from Dublin, take the N7 towards Limerick. As you get nearer to Limerick, you pass through Birdhill. Some miles later, you come to a roundabout. Here you turn off onto the Limerick By-Pass (N24) - direction Cork / Tralee - (see next paragraph). From Limerick, you take the N20 - direction Cork / Tralee. Later, you take the N21 - direction Tralee / Killarney as far as Castleisland. At Castleisland, you take the road for Killarney N23. After you pass Kerry Airport on your left-hand side, you come to a T-junction at the village of Farranfore. Turn left here - then very shortly after, you take a turn to the right, onto the start of the N70 for Killorglin. But be careful you don't miss it! It's a concealed turn-off. Carry on driving onto the N70 - direction Killorglin. After Killorglin (still on the N70), you head for Cahersiveen. Coming from Cork, take the N22 all the way to the by-pass before Killarney. Drive anti-clockwise around the "Ring of Kerry", from Killarney on the T67, direction Killorglin - and then onto the N70 for Cahersiveen. ***If it's lunchtime, bear in mind that Cahersiveen is the last town before you get to Ballinskelligs. So do make sure you have a bite to eat here! After you pass The Ballinskelligs Inn (also known as Cable O'Leary's) - a large pub / B&B on your left-hand side - you come to a cross-roads, where the main road swings round sharply to the right. * But you do not!!! Instead, you carry on straight ahead, along the coast road, in the direction of Ballinskelligs Bay / Ballinskelligs pier. You then pass a small ruined church, over on your left (it's across the fields, by the sea-shore). Driving on - you take the next turn on the right. About a half-mile later, you come to a fork in the road. Veer right at the fork. Almost immediately, you take the next turn on your left. You carry on up this narrow road. We are the first cottage on the left! It's a white cottage. If you carry on past the cottage (just past the trees), you will find ample parking space in to your left. You'll know you've arrived - when you see the white garage! Do you wish to spend a night or two in the locality? For your accommodation, the following guest houses and hotels are recommended. Click onto each B&B below, in order to be linked to their website. Or if it would suit you better, to stay in Killarney (1 & half hours away) or elsewhere in Kerry - then Click here for hotel details. Just click onto ‎AirB&B - search for Ballinskelligs and Cahersiveen. # # # Be sure to run this page off on your printer before you set off ! See below - for the weather in Ballinskelligs right now !